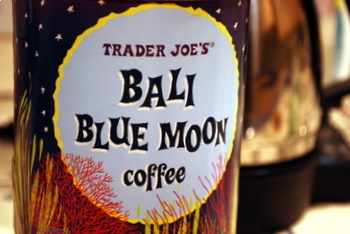 The Blue Bali Moon coffee, which is new at Trader Joe’s this month, has a great, eyecatching look to the packaging. The coffee is from Bali, which is known for mild, yet fairly complex, blends. There isn’t enough land on Bali to really have big coffee estates, and instead the beans tend to come from multiple growers for every batch of Bali-grown coffee. This particular coffee is a medium-roast. It has a great roasty aroma to it, with hints of a smoky earthiness and a touch of sweetness. In other words, it smells delicious and offers a good, full-bodied flavor that is neither too dark nor too light. This is my current “everyday” coffee to brew in the mornings, as it’s inexpensive and goes well with just about everything.